If you haven't put your finger on it, color is kinda my jam. To be frank, I think bright colors look best on my skin tone, versus neutrals. The other day I noticed I looked a helluva lot better than I thought as I walked past a mirror in my new red blazer -- it was shocking. In comparison to when I wear a black blazer, there was a noticeable brightness to my features and a literal pep in my step. 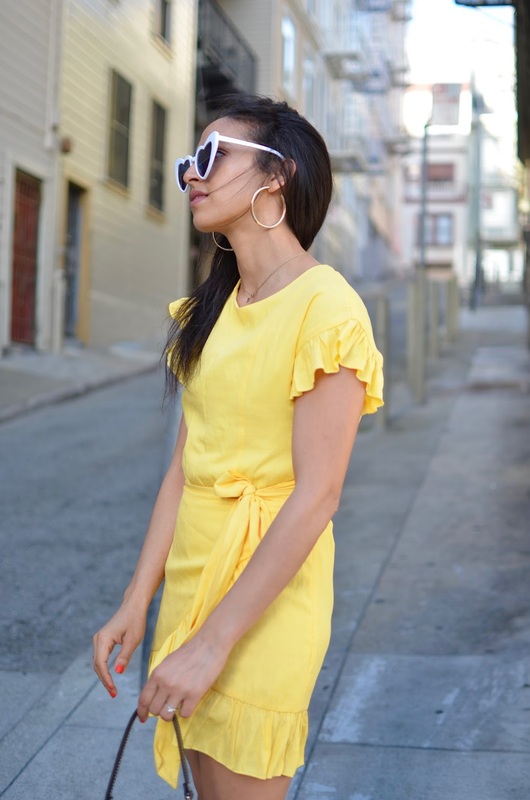 So when this frock in the most gorgeous shade of lemon and perfectly sweet ruffles to balance out the sass found it's way into my dressing room at Isalis, I near about died, and you guessed, took it home. If you are in the San Francisco area definitely check out this cute little shop in the FiDi district. The texture is a soft linen blend and the easy-to-tie wrap skirt allowed movement without revealing too much. 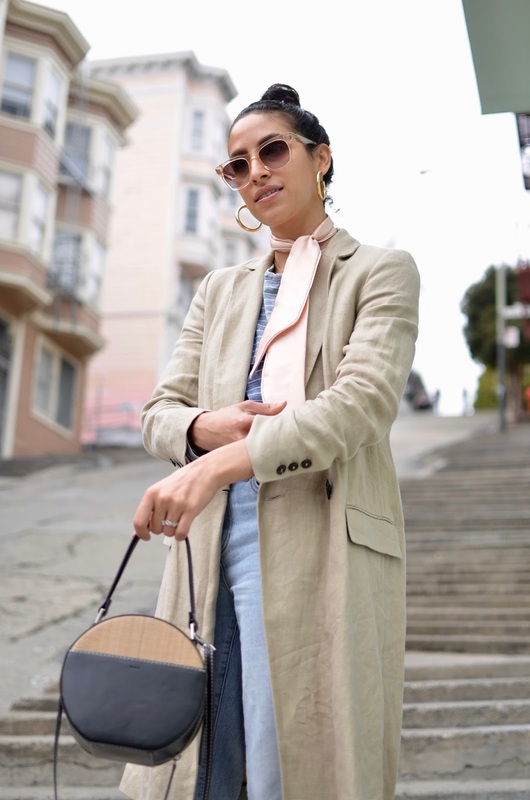 I added my favorite Anine Bing boots to sharpen the overly saccharine dress, a boxy plaid blazer for the typical San Francisco wind chill, and my new heart sunglasses which feel hysterical on but trust me when I say they get all the compliments. Red and I seem to be having a moment. See my IG feed for a clear picture of what I'm talking about. It's one of those colors that just give life, amirite? I know what you might be thinking! "Red isn't my color," "doesn't look good on me" or "it's just too loud." Well if you are here for a basic outfit of the day, you might be at the wrong place, my friend. The minute I threw on this fun and super bright Faithfull The Brand jumpsuit, I knew a cherry red linen blazer topped with a bright red lip seemed to be the perfect accouterment to bring out the best of this look. 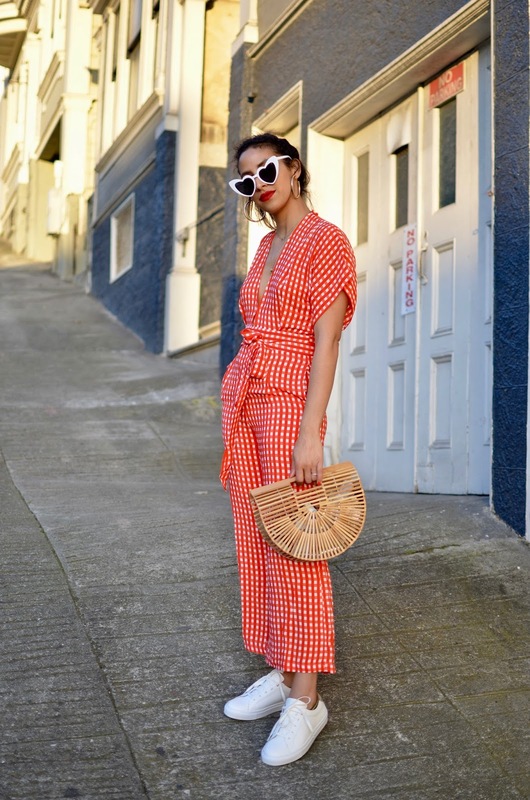 But why stop at red on red on red when you can add some fun heart-shaped sunglasses (soo cheap, BTW!) and call it a day. 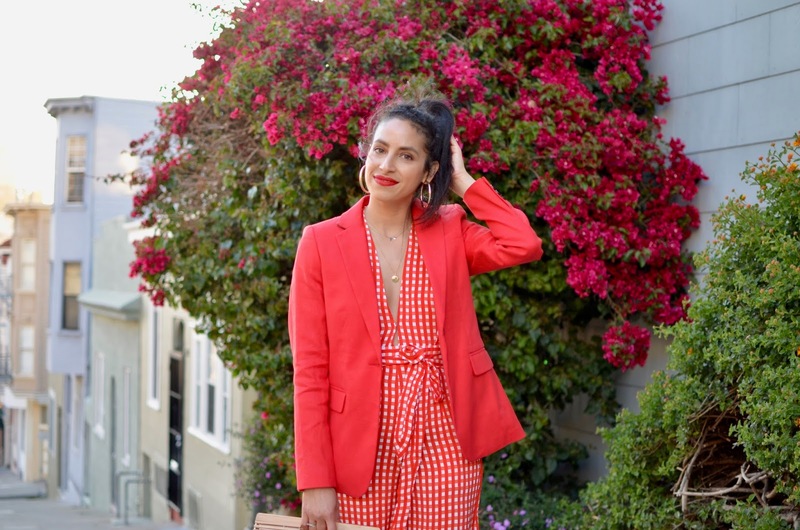 Let's just skip Spring and head straight into Summer with this look, shall we? Who else is ready for some sunnier days? Most weeks my sister and I will go on a long run to catch up, get those endorphins up and most of all carve out a bit of time for each other. Even though we live in the same city, it gets hard to dedicate time to hang out since we both lead our own very-busy separate lives. This post-work fitness hour or two is great for both of us physically and emotionally. This past week, in particular, I was telling my sister about a trying week I had, that I felt upset, defeated, and most of all jealous when comparing myself to my peers. I know, it sounds so ugly when I say it out loud, thankfully my sister (being the younger, wise old soul she is) put me right in my place and let me know that a setback shouldn't be a form of defeat but the catalyst to tell myself to keep moving along. That when I pause to wallow in my sorrows, it only defeats myself proactively. So this weekend I'm going to give myself a weekend to live and enjoy my BEST live, then next week I'm just going to try better to not be so hard on myself, put a smile on and keep moving along. In college, I made it a point to head to the gym once a week (for social reasons mostly), maybe went for a quick run around the sorority block (probably to work on my tan), and most definitely never enjoyed any of it. It was a means to control my weight and eat even more nachos that at-the-time I didn't see any issue with. Fast forward years later post-graduation I grew a new found appreciation for breaking a sweat. It wasn't easy and took a lot of trial and error to figure out the right classes and sweat sessions that felt fun and right for my body. On top of that I didn't just want to work out better I wanted to see the fruits of my labor and see a change in my body so eating healthier was step two to finding a better balance. Currently, I am training for a 10K. In February I ran one so this one will be my second 10K in a few months. The training is my favorite part, it allows my body to prepare itself for the big run. Last time around I didn't push myself enough to run on hills so when it came time to do it for real I overexerted myself and hurt my knee somewhere along on race day. To be better prepared for this race I partnered up with Flywheel-- an indoor cycling studio-- to train better, smarter and push my body for the upcoming race. I've been a fan of Flywheel for many years now, I've spent many a bad-Monday in the studio sweating out the day. The energy from the tireless instructors, immaculate facilities, perks I didn't even know I needed like fresh fruit, face wash, and endless bobby pins make this gym one of my favorites in San Francisco. If you are in the area, I'd definitely recommend this gorgeous gym, central to downtown and the Embarcadero. Use code FLY VANILLA for your first class on-the-house! Post sponsored by Flywheel. Photography by Jessica Monroy. 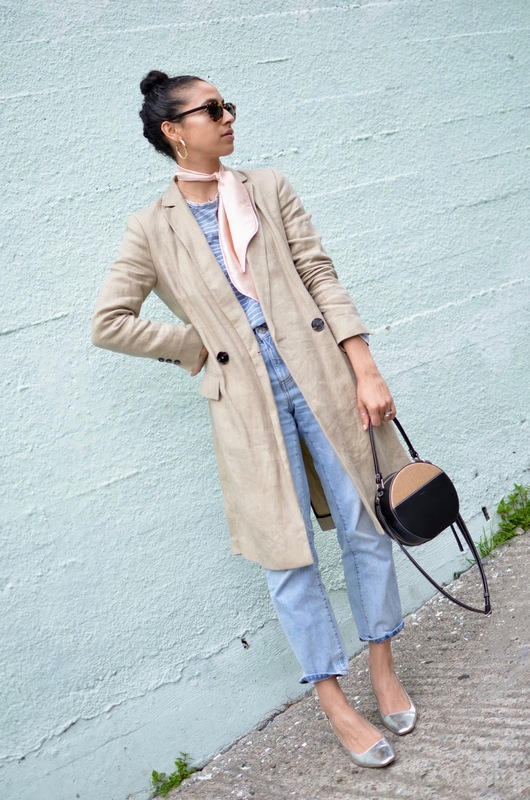 Even before the first day of Spring officially hit I was ready to wear my lighter tones and pastel neutrals. This longline blazer was a Zara Winter sale find a few years ago, I really liked the double-breasted look of it even though I wouldn't wear it for a few months after it came in. And guess what? 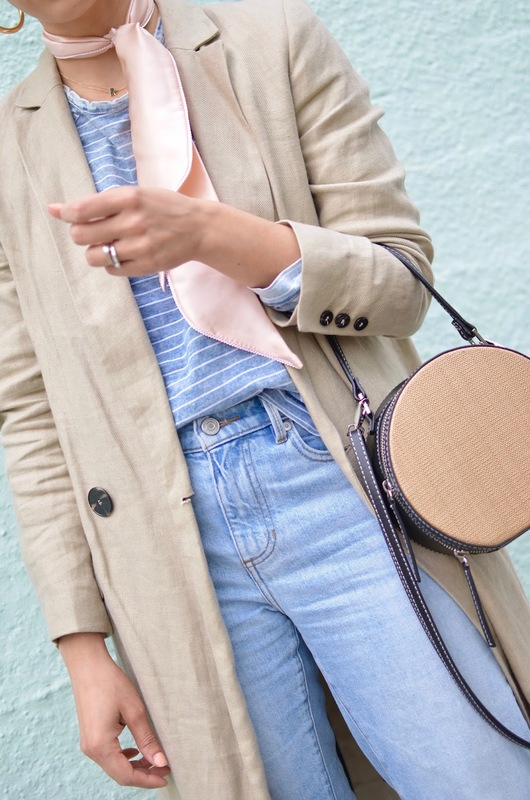 Linen is in, in a big way this season. 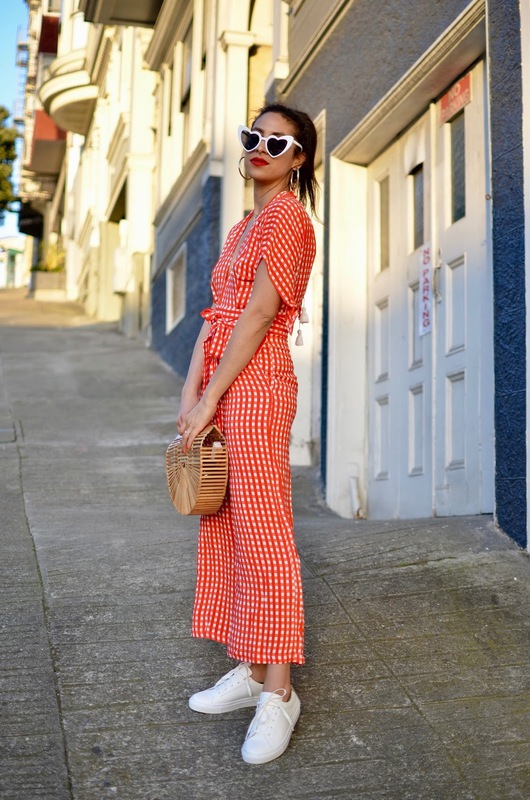 I'm just going to go ahead and call it, linen and polka dots are this Spring's micro-trends! Are you a fan of any of them? 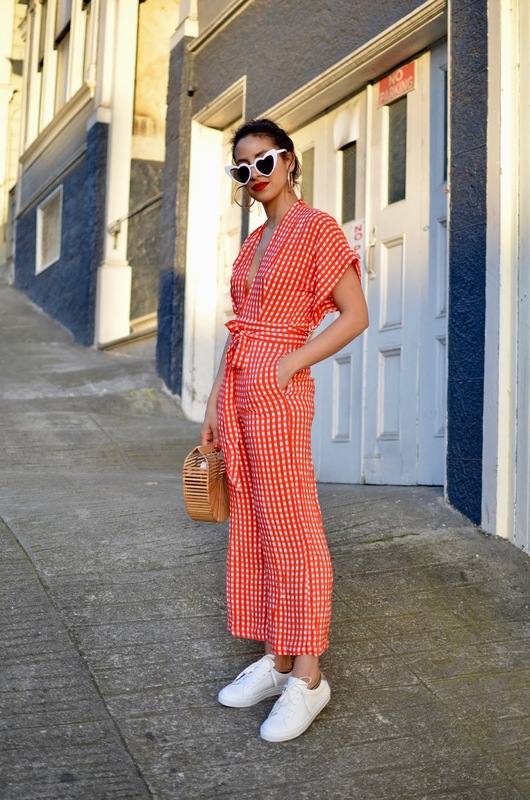 Do tell and send me your recommendations to shop, I need more polka dots in my life. I was lucky enough to attend Alt Summit for the first time ever earlier this year, and as a fellow blogger or overall enjoyer of blogs, you know how big of a deal this can be! 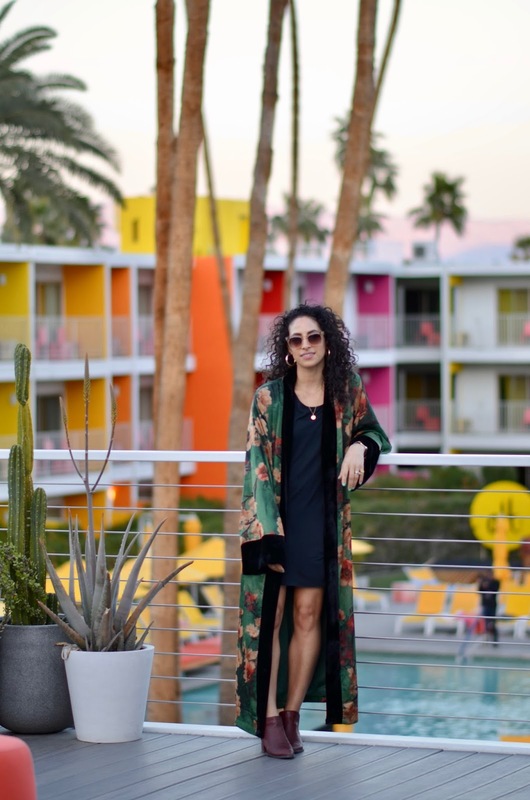 I learned a great deal from empowering and knowledgeable speakers, soaked up all the creative and contagious energy from fellow creatives and was utterly inspired by the colorful and happy vibes in Palm Springs. Did I mention it was also my first time in Palm Springs? 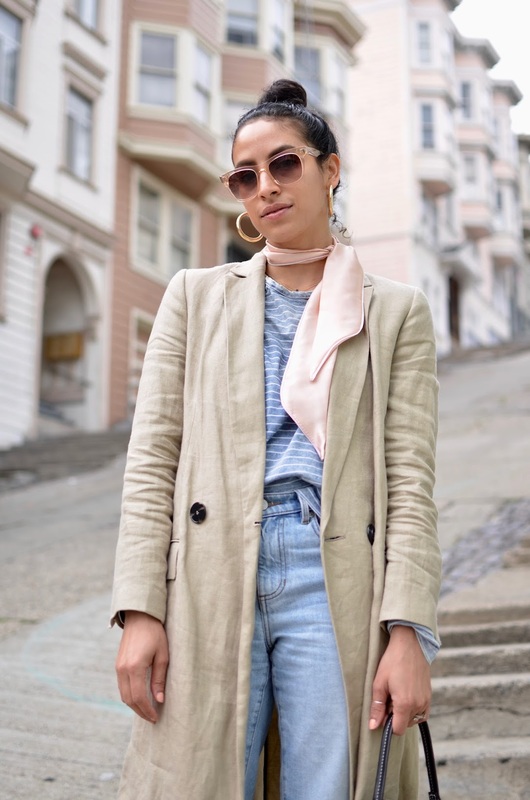 The weather was on the cooler side, so I did bring my standard San Francisco day-to-day attire and ended up with a bohemian business chic look overall. Look 1: This Kimono screams boho Palm Springs relaxed attire, I was intent on doing it justice in the land of palm trees and perpetual tans. I added a little black dress underneath to fully let the kimono shine, let my hair down, literally, and added my fave red boots to complete an easy desert-chic look. 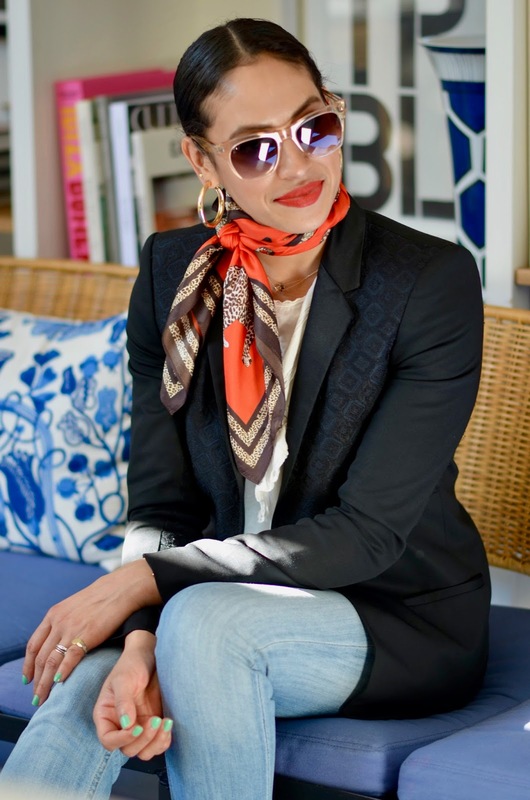 Look 2: Granted this look is more business chic than boho vibes, but can we at least agree it's cute and you know you want to tie a neck scarf on now, am I right? The lighter shades of the peasant top and the light wash denim make it appropriate for Palm Springs, and the pops of red, slick back ballerina bun and silver shoes make it more me and elevate the look. 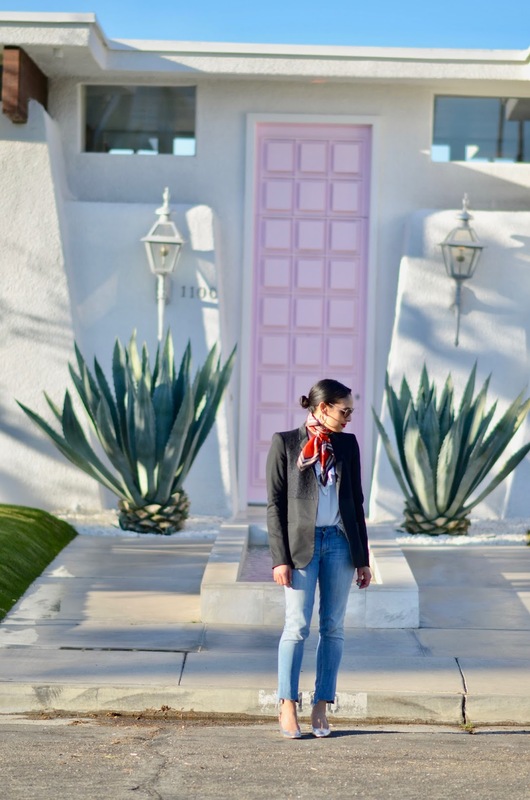 While it might have been more conference business chic, I def wore this look while scouting out all the PS classics like the Pink Door house, the Parker, and all the charming hotels that somehow don't seem to mind when you just wander in to photograph even though you aren't a patron. Look 3: Somehow that big-city-girl-look that doesn't shy away from all black outfits ended up in my suitcase. It's strange because it isn't a look I usually wear, perhaps I was mourning the end of the conference? Either way, the dress is lovely on its own but since it was a chilly day the blazer was worn on top since it was the only jacket other than the kimono that I brought with me.